We packed all our stuff one last time, returned the micro-crampons and had some tea and pancakes for breakfast. It still amazes me how these guys were able to cook anything so tasty at that altitude, battling those dips in mercury. I would praise myself if I was able to cook anything at all. Once I had returned the micro-crampons, walking around the campsite became difficult. I had taken two boiled eggs and slipped on the hardened snow while walking towards my tent. The eggs flew off my hands. That wouldn’t be my last slip. At least, I didn’t have to crack the shells before peeling them. This is a hamam. There are two chambers. 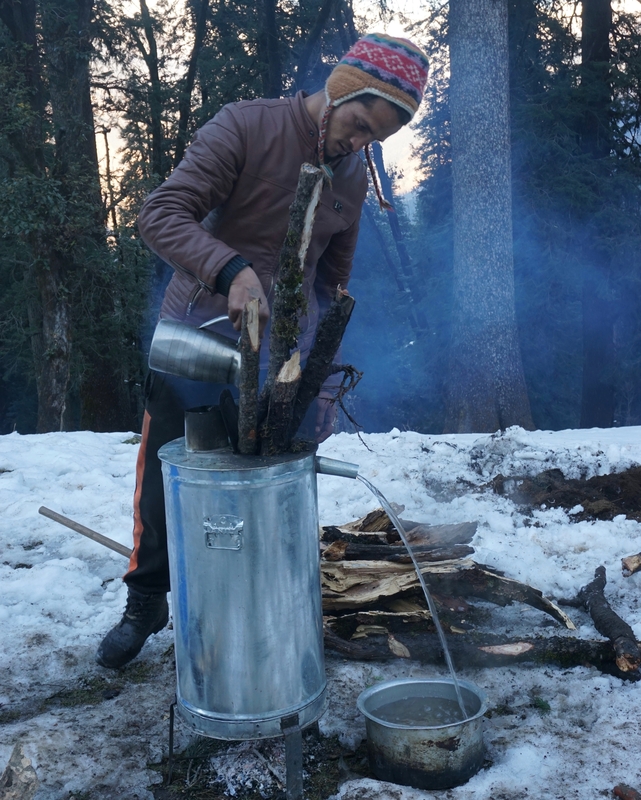 One is used to burn the wood and the other for the water. Water is passed through a heated chamber and comes out boiling hot from the other side. Around 9:00 AM, the ascending team left for Luhasa while we were headed back to Sankri. Running was not an option as the frozen surface of the trail had become too slippery. Sometimes the layer of slippery ice was so thin that it was hard to figure out if it was a sticky dirt surface or not. I tried wading through deeper snow wherever possible. Still, it was impossible to avoid that slippery trail. Between our campsite and our first day’s lunch point at Jainola, I slipped thrice. Siddharth, who was with me, also slipped thrice—one of the times just because his bag was braised by a mule and he lost traction. Shubhajit, who was ahead of me escaped with a single fall that caused him to slide quite some distance. I am sure that quite a few trekkers behind us had experienced falls. Jainola had lost all its snow in the last three days. I had some tea, while others also ordered some omelettes and Maggi. 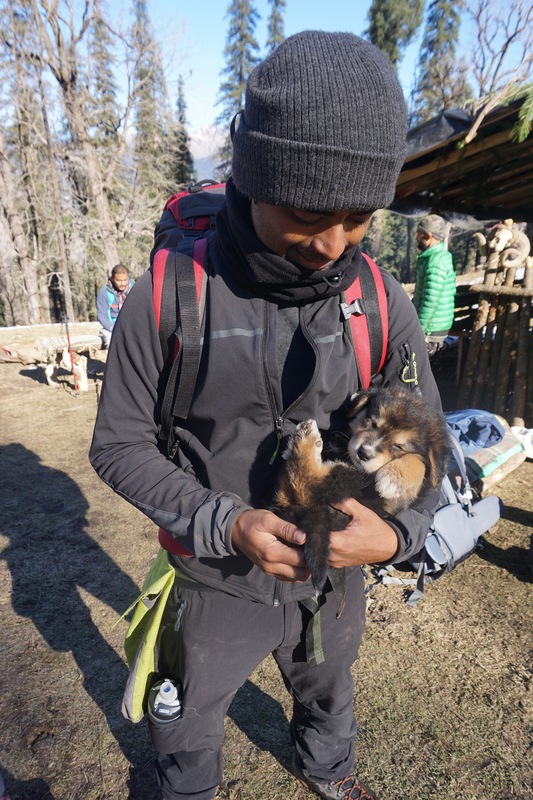 There was a Tibetan Mastiff puppy in one of the dhabas which became a cuddling toy for most of us. 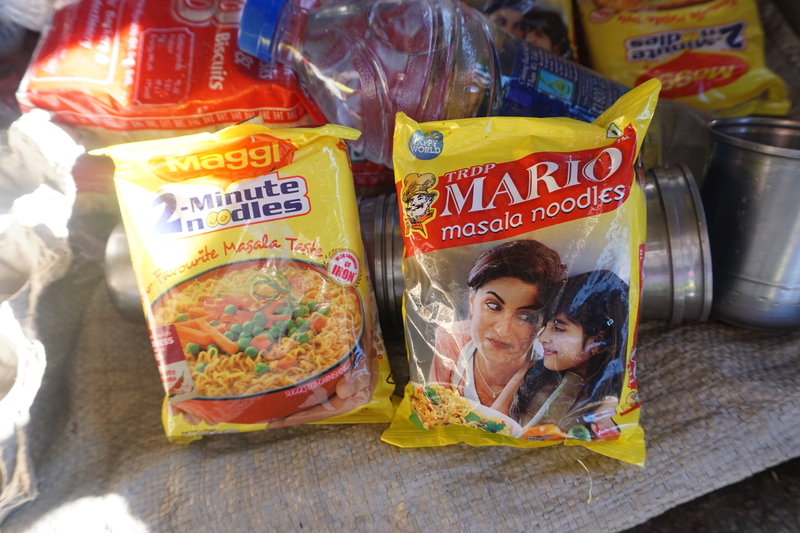 I do not know if what we were having was Maggi or Mario. The latter even has a few international variants with different flavours and packaging. Me cuddling the Tibetan Mastiff puppy. Once we left Jainola, the path was dry and I was able to run again. I descended behind Dev and Shubhajit. 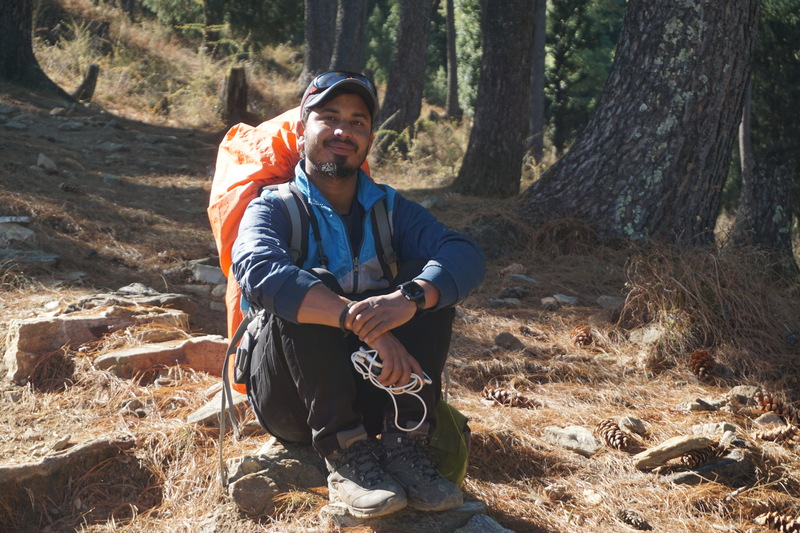 The latter, having grown up in the mountains and hills of Meghalaya, was an excellent trekker. Dev was in a hurry. He had to contact the guys at Sankri so that he knew where we would be put up for the night. Just before the opening in the pine trees, where we saw Swargarohini range on our first day, we waited for everyone to assemble so that we could head to Sankri together. Dev, after doing a good job with the group. Gypsy Children, a wooden bunk hotel, was supposed to be our home for the night. That is, if everybody had stayed there. We had our lunch, settled all dues and deposited the fleece liner and eco bags. I even got a tee that said that I have been to Kedarkantha. Since this trek was two days shorter than the Har-ki-Doon one, people had extra days. Some headed back to Delhi while others went towards Mussoorie-Dehradun-Rishikesh. Luckily, Shubhajit was headed towards Yamunotri. I decided to tag along with him for the next two to three days. 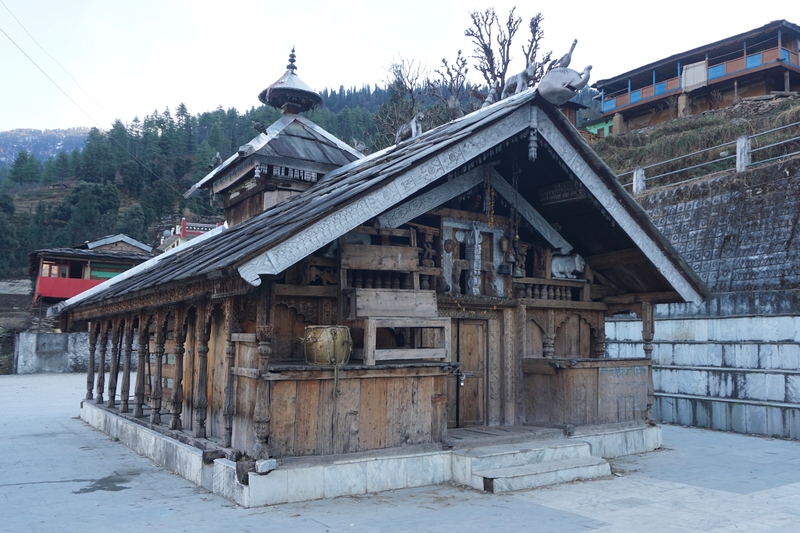 While we were waiting for our cab to arrive, me and Shubhajit visited this temple in Sankri village. 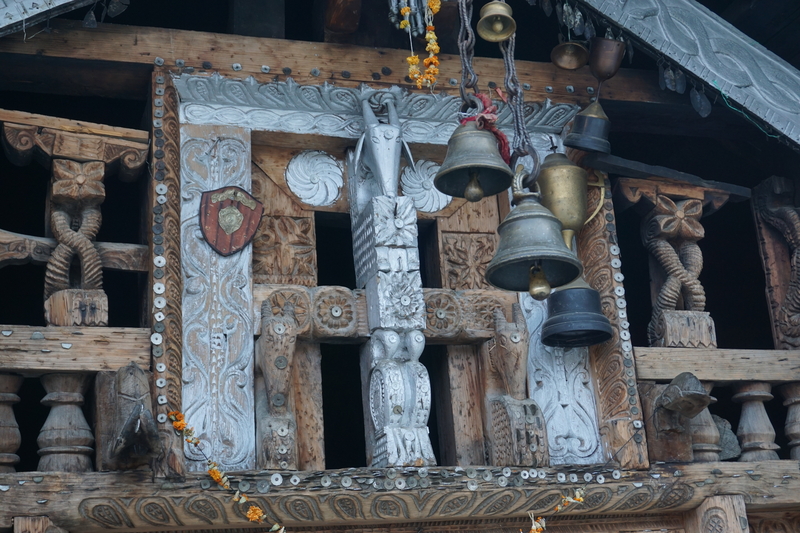 A good amount of effort had been put behind the designs of the door, pillars and beams. We headed back to Purola with a group of three Marathi trekkers—two guys and a girl. For them this was their first trek. I am sure this would instil a desire to venture out more and more into the hills. Even Karthik praised Aditya, one of the Marathi guys. He was a slow trekker but he was very consistent with his pacing and rest. Speed is often not that important. At Purola we bid them goodbye and got ourselves a room at Hotel Classic Hill View in Negi Tower. This was the same place where we had our lunch en route to Sankri and the same place where Shubhajit and Siddharth had put up for a few days before heading for the trek. It is hard to express how good it felt while taking a bath after five whole days. The cook at the hotel, Mr. Pratap Singh Rana, used to cook in 5-star restaurants but had to move back to Purola due to some family emergency. He made an excellent Chicken Kadai. Shubhajit later told me that during his earlier stay, he made some amazing rai ka saag from ingredients that Shubhajit had bought fresh from the market.